A common complaint about the hexcrawl format is the breadcrumbs issue. That in order to gain a high level view you need to read a locale, read the surrounding locales, then their surrounding locales in order to get a sense of how it all put together. 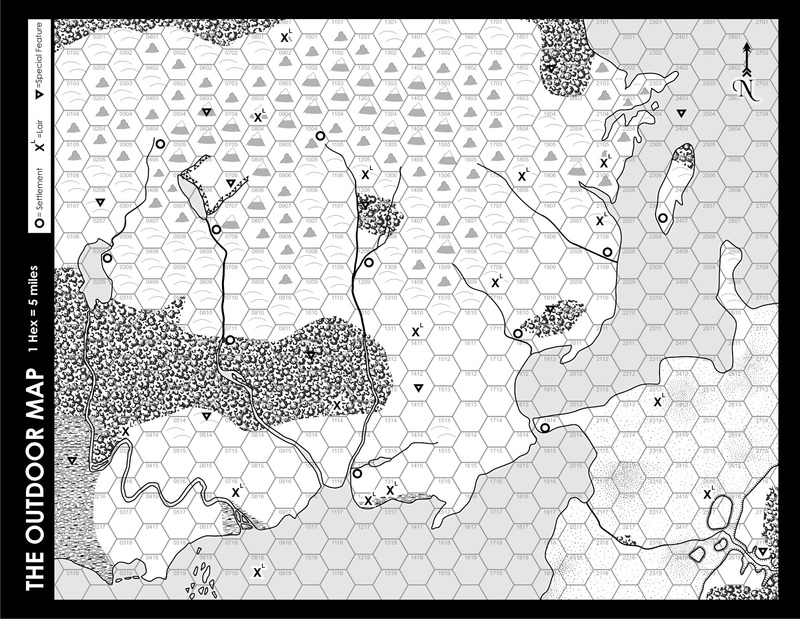 This is why my hexcrawls setting (Points of Light I & II, Blackmarsh, etc) are more than just a series of locales keyed to a hex map. I purposely include a overview to explain the high level details of the area. Leaving the local details to the keyed locales. This doesn't eliminate the "breadcrumb" issue, but the hybrid format does retain the hex-crawl format brevity with the overview providing what the author thinks are the important high level details. Because what goes into the locale is the local level detail the breadcrumbs are usually very short. Special Notes (For example in one map I used this to list all the barbarian tribes which spanned over multiple hexes. In another I used this to explain the various factions engaged in a civil war. It may be that some settings are mostly overview with a short locale list, and others it is vice versa. The author needs to look at the material and figure out the exact balance between travelogue and hexcrawl that works for this particular setting. My friend Tim just released a print edition of his adventure Knowledge Illuminates. You can read about it in his blog post. I contributed to this adventure by drawing the map of the dungeon. When I went through it several years ago it was a nice short dungeon full of atmosphere and weirdness. The public version is no different and Tim has cleverly added hooks to allow Knowledge Illuminates to be the beginning of a larger campaign as well as just being a small standalone dungeon. I never made a print ad for Blackmarsh, like I did for the Majestic Wilderlands and Scourge of the Demon Wolf. But since James offered to include ads supporting various OSR projects in the back of Petty Gods, I figure I should make one for Blackmarsh as it is one of the few open settings available. As with the other ads this is a homage to Trampier's illustration in ADnD's Player Handbook. 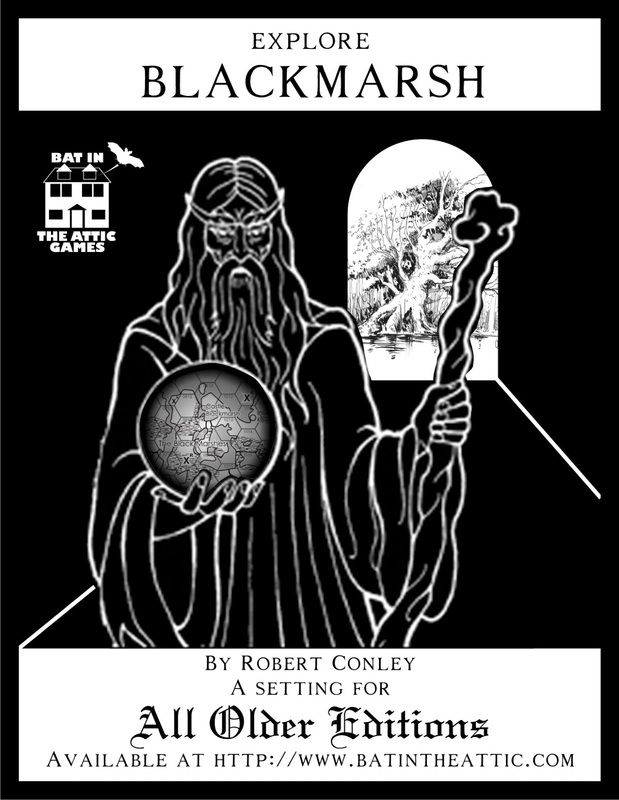 Blackmarsh is free download at RPGNow, and is $7 for a print copy, along with a open Setting Reference Document that dual licensed under the Open Game License and a non-commercial Creative Commons License. Which means you can alter it, add to it and even publish it if that your inclination. Lulu has a 20% off sale using the code JEKYLL. 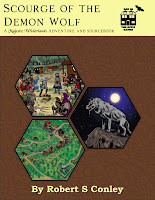 So if you looking to buy the print copy of Scourge of the Demon Wolf on Lulu you can buy it at a discount until the 26th. Labels: Scourge of the Demon Wolf. *There will be a print option on RPGNow in about two to three weeks. A 72 page adventure compatible with the Swords and Wizardry rules and a setting supplement to the Majestic Wilderlands. detailing a small barony, a complete fantasy village, a conclave of mages, a crossroads hamlet, and a camp of wandering beggars. Labels: Legacy DnD, majestic wilderlands, News, Scourge of the Demon Wolf. I will be running the following at Erie Days of Gaming on October 27th. Deep in the heart of the orc infested forest are the ruins of an elven temple. 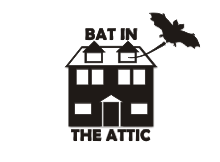 An original Dungeons and Dragons Adventure for 2nd to 5th level characters. Novices and experienced players welcomed. All materials will be provided including character creation. A megacorporation, Ling Standard Products has hired the ship to bring supplies to a research outpost. A Classic Traveller adventure. All materials will be provided including character creation. A reader asked about a map I contributed to Fight On! Here it is, I drew a generic map for people to fill in with their own material. I just bought my CD full of 70s/80s style zipatone landscape fill and was eager to make a map using them. The symbols should be pretty explanatory. The triangle line near 0706 is a glacier. The line with hatch marks spaced along it in the lower right are escarpments. The X with a small L are lairs. The upside down triangles are ruins/points of interest. The circles are settlements. This map is open content under the Open Game License. So feel free to use this for your own projects. James Maliszewski of Grognardia ordered a Judges Guild style version of his Dwimmermount outdoor map from me a couple of weeks ago. 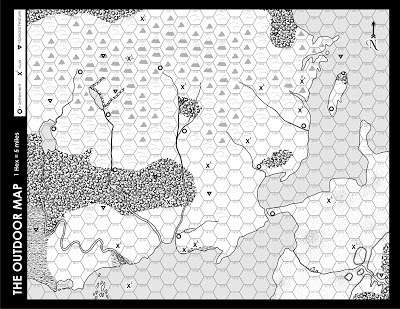 Since he used the Outdoor Survival gameboard as his template and I done some work recreating the gameboard as a RPG map, it was a pretty straight forward project to do. I played around with some of the textures, finally getting around to recreating a scrubland fill to use for plains and other open terrain along with selecting a badlands fill. I enjoyed doing this and helping to get Dwimmermount closer to completion. 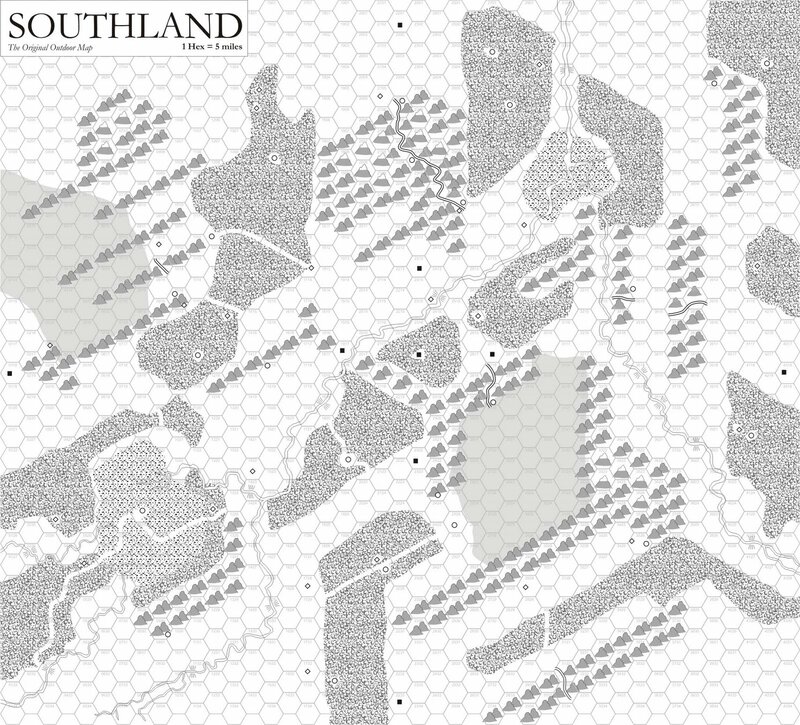 I reworked the northeast corner to fit the southwest edge of my Blackmarsh setting. If you like the tv show Fringe and parallel worlds then use the following table whenever the players try to leave Blackmarsh by land on the southern edge. Chalk it up to a weird by-product from the Mountain That Fell. 11 they don't know where they wound up and it isn't good. 12 Walternate greets the party and escorts them back to the Fringe Division where they are brainwashed into thinking they just came from having a really intense boffer LARP weekend. Heading back north takes them back into Blackmarsh. Both the Lulu proof copy and the RPGNow proof copy are on their way. 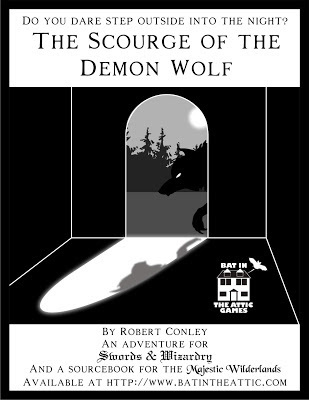 If everything goes well Scourge of the Demon Wolf should be out in two weeks. The product is both an adventure and a supplement. The first half is a 32 page adventure and the second half a 40 page supplement for the Majestic Wilderlands. For the supplement portion I took some of the locale that I lightly describe in the adventure and flesh them out in more detail. They work together similarly to how the rules and campaign guide does in the Majestic Wilderlands Supplement. Either one can stand alone but I think it makes for a better product to have them both together. The adventure has immediate use, and the supplement give value to the book after the adventure is completed. To get a taste of what you are going to be able to get in two weeks here is a 18 page preview. It has the first 9 pages so you can get a sense of what the adventure is about. It has one of adventure's encounters, a Bandit cave. And from supplement half, the crossroads hamlet of Denison's Crossing. It also showcases the excellent art of Jason Sholtis and John Larrey. And has a map of the Golden House. For those of you that were disappointed that I didn't include one of my signature hexcrawls in the Majestic Wilderlands, I fixed that with Scourge. It is only a small Barony but should give you a taste of what my setting looks like on a local level. This book represents the most common type of adventure I run in my Majestic Wilderlands. There is a dangerous situation, a bunch of people with conflicts and the player characters are right in the middle of it all. I am a little nervous about the presentation as the I have to pick some order to present the various possible encounters the character can run into on the adventure. Every time I ran this, stuff occurred in different ways at different times. I tried not to leave the impression that the order in which I present the encounters is the way the adventure has to be run. The book will be $15 and the PDF $10. The OSR keeps chugging along, my opinion is that the Old School Renaissance is at its best when an author or company implements older edition rules to detail a specific setting or subgenre. Dungeon Crawl Classic is a great example of how a specific vision can create a memorable product. Now we have two new products that expands the older edition family of games into interesting direction. First is a medieval African themed RPG by Kevin Crawford of Stars without Number fame. He has started a kickstarter so you can get in on the action. The minimum buy-in is $8 for the Spears of the Dawn PDF so it looks more than reasonable. There even a preview of the first chapter, character creation, so you can see what you are getting into! Next is Arrows of Indra RPG by the RPG Pundit which implements older edition gaming using the myths and legends of India. Note that I did the maps for this. Even if you don't run a campaign using either game as the core rules, the fact they use the older editions as a foundation makes it easy to use the elements of both RPGs to represent various exotic lands on the fringes of your setting. Joseph Bloch over on the Greyhawk Grognard has posted that Wizards are doing 2nd edition AD&D reprints. Of greater interest to me are the hardcover releases of The Slaver series (A1-4) and the S series (S1-4). I will probably definitely get those. Over on Grognardia, James poises a question about how much detail to include in a setting product and states his preference for the format I used in Blackmarsh. By far the most common format for settings is the travelogue similar to a Fodor travel guide. Fodors and other travel guide brands have been around for a while so it only logical that when the RPG Industry started publishing that they adapted the format. However while great to read, I feel the format is ill suited for RPGs. The travelogue format requires an extra level of work in order for its details to be used during a session. Is there an alternative? Yes! It is the format pioneered separately by Judges Guild's Wilderlands and GDW's Traveller. You present a table of coded entries some terse written details keyed to a map. Both Wilderlands and Traveller use a numbered hex grid. The format doesn't eliminate all the work but does have the virtue of being more easily used during a session compared to the travelogue. It also allow to quickly see what in nearby locales making it easier to allow the characters to wander the landscape. This is the genesis of the format I used in Blackmarsh. I want to insert a caveat here. When I talk about utility, I mean talking about writing a setting in such a way that is doesn't take any more work to use than an adventure of comparable page length. The format's utility doesn't mean all work is eliminated and especially doesn't mean that referees that like to create their own material will like it better. 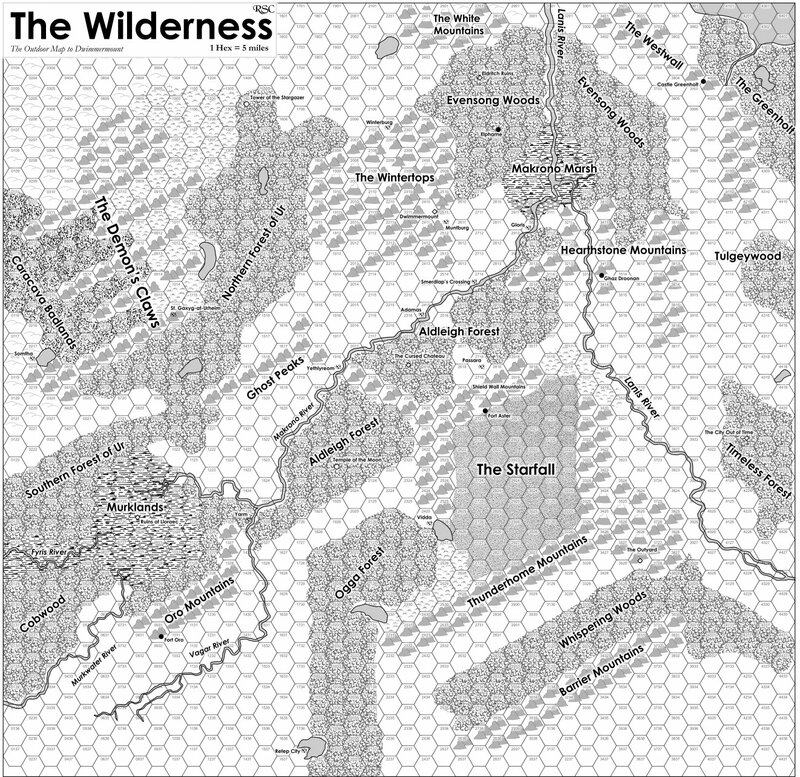 The form I use today stems from the work I did for the Necromancer Games version of the Wilderlands of High Fantasy. When the project getting off the ground there was a lot of debate on how to write the new version. Clark Peterson of Necromancer Games felt that the original coded tables were not sufficient, however other than that little headway was being made. I advocated taking the terse paragraphs of the original Ruins and Islands and applying it to all entries including lairs and villages. Finally I state down and wrote Rorystone Road to illustrate what I was talking about. 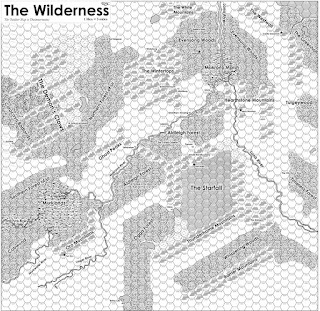 Clark then refined my initial crude outline and the result was the format of the Wilderlands Boxed Set. The boxed set also demonstrates the power and utility of the format. An area equal to that of western Europe is covered in at a fine level of detail in only 400 pages. Imagine how big that would be if you wrote it like a Fodor's Travel Guide. Despite its volume it is still usable as is. The problem with the Wilderlands Boxed Set is that it was a $70 product. A pretty big commitment for a product written in a uncommonly used format. So I resolved to find a way to publish something smaller that didn't cost so much. As it turned out I got the opportunity with Goodman Games and wrote Points of Light I and Points of Light II. I further refined the format in writing those two products. Thanks to Clark's work on the format of the boxed set I added a section detailing any named Geographical entries on the map. I also added a second section which varies depending on the map. In the second section I write about any unique chracteristics or groups. For example in Points of Lights I that section is details the various barbarians and humaniod tribes. Also in both Points of Lights, I play around with different times, and different themes. Because of the compact format, I am able to pack eight different settings in two books. All of which have immediate utility at the table. 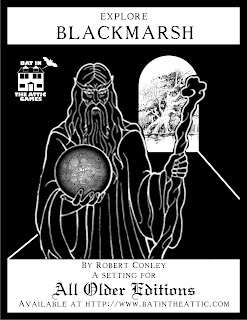 Finally this leads up to Blackmarsh which is my most recent release using this format building on the legacy of Judges Guild and the authors of the Necromancer Games boxed set. Locales - keyed and sorted by location. May include a mini-map one column width wide. Detailed Locales - if desired for example Castle Blackmarsh in the Blackmarsh setting.